The oath of office was administered to New Haven’s newest police officer, Zach Beegle, left, during a recent council meeting. Also pictured is Mayor Greg Kaylor. NEW HAVEN — The Town of New Haven will be ordering a new garbage truck after months of dealing with mechanical issues with the present one. The council voted at its most recent meeting to order the Hino truck from Matheny Motors in Parkersburg. Present were Mayor Greg Kaylor, Recorder Roberta Hysell, and council members Roy Dale Grimm, Steve Carpenter, Grant Hysell, and Matt Shell. The cost of the new truck will be approximately $125,000, according to Kaylor. The town will pay $1,705 per month for seven years, at an interest rate of five percent. The mayor said it will be around a year before the truck is finished and delivered. If the town sees in three or five months that it cannot afford the payments, there will be no penalty for the cancellation, Kaylor added. The Hino motor in the truck is made in West Virginia, the mayor stated, and because it does not have dual axles, the town saved $22,000. The truck must be driven by a CDL operator. The present garbage truck should be fixed in September, at which time a loaner truck from the City of Point Pleasant will be returned. Also during the meeting, Police Patrolman Zach Beegle took the oath of office. Administering the oath was Mayor Kaylor, assisted by Police Chief Dave Hardwick. Discussed the need for a computer system upgrade for town hall. 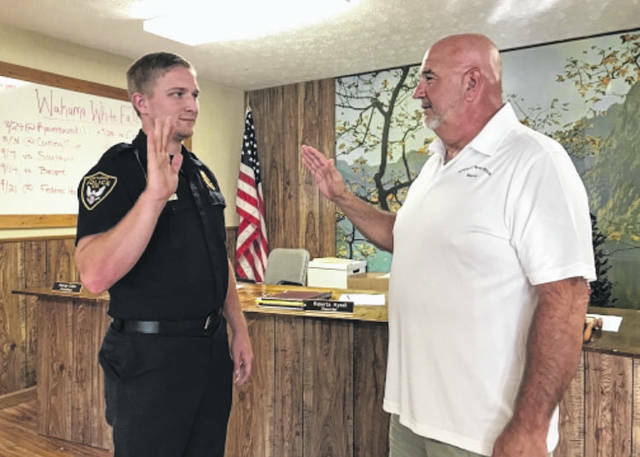 The next meeting will be Sept. 10 at 6 p.m.
https://www.mydailyregister.com/wp-content/uploads/sites/24/2018/08/web1_0830.Council.jpegThe oath of office was administered to New Haven’s newest police officer, Zach Beegle, left, during a recent council meeting. Also pictured is Mayor Greg Kaylor.